LeBron James made his triumphant return to Cleveland in June and Cavalier fans have high hopes their hometown hero can bring the city its first major sports' championship in 50 years. One Cleveland native would like to watch the magic unfold outside of his prison cell. 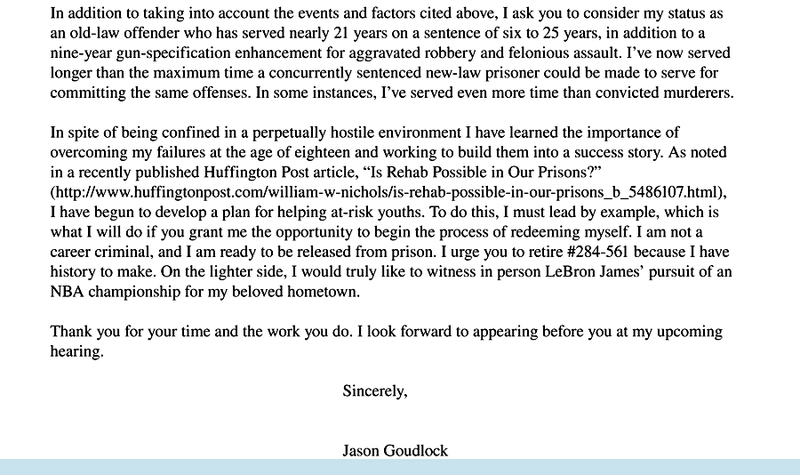 Jason Goudlock wrote a letter to the Ohio Parole Board and asked for the "opportunity to being the process of" redemption, according to The Smoking Gun. Goudlock entered prison at age 18 for felony aggravated assault and robbery in 1993. The board has been denied the 39-year-old man parole four times during his incarceration. Goudlock argues in the letter that under a new law passed in 1996, he already has served longer than the maximum time. Instead, his old-law status requires him to keep going before the Parole Board, a process only required for convicted murderers under the new law. "In some instances, I've served even more time than convicted murders," Goudlock wrote in his letter. The Ohio prisoner wrote a book, "Brother of the Struggle," about his experience and has been featured in a story about prisoner rehabilitation on The Huffington Post. Goudlock wants to start his life in the real world again and has started to develop a plan to help at-risk youths. "My main motivating factor is my desire to help at-risk youth avoid making the detrimental mistakes that I once made, which ultimately led to being incarcerated," he told Huffington Post. He finished his letter to the Parole Board on a "lighter note." "I would truly like to witness in person LeBron James' pursuit of an NBA championship for my beloved hometown," he wrote. No Cleveland sports team has won a major championship since the Cleveland Browns won the 1964 NFL Championship Game. James took the Cavaliers to the NBA Finals in 2007, but they were defeated by the San Antonio Spurs.